Yellow mixed with blue is one of the most common color combinations in Provence, a region in the south of France. The region is known for sunflowers and lavender, for warm sunny days under blue skies, and for Impressionist painters whose paintings reflected their bright sun-drenched surroundings. 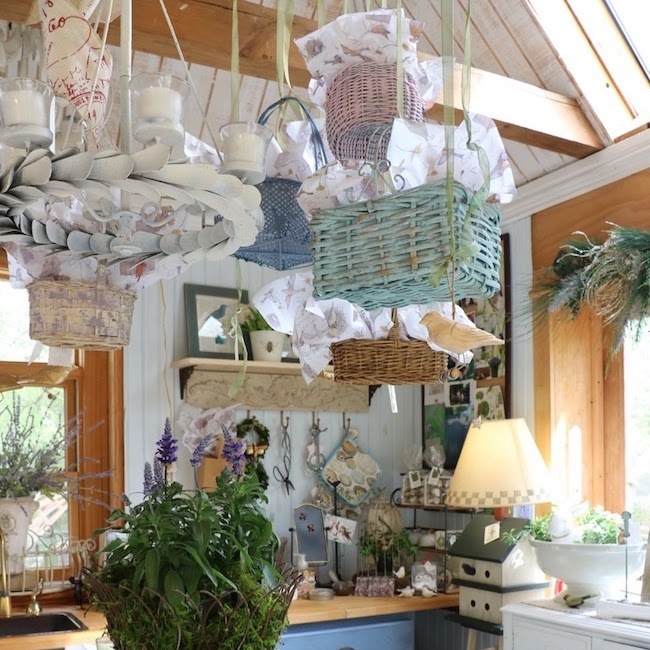 Likewise, local Provençal potters and weavers used those same colors to create dishes and linens making it easy for us to add Fall French style to our kitchens. 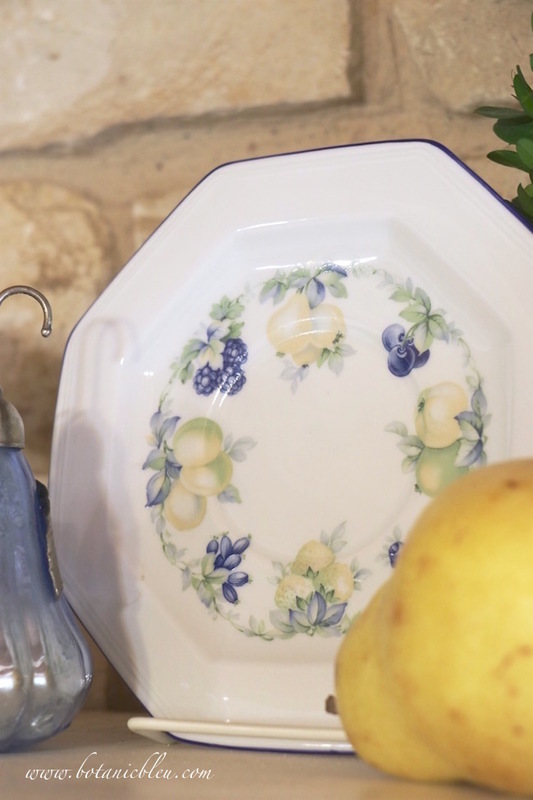 With just a little yellow, we can give blue and white dishes a Fall look. 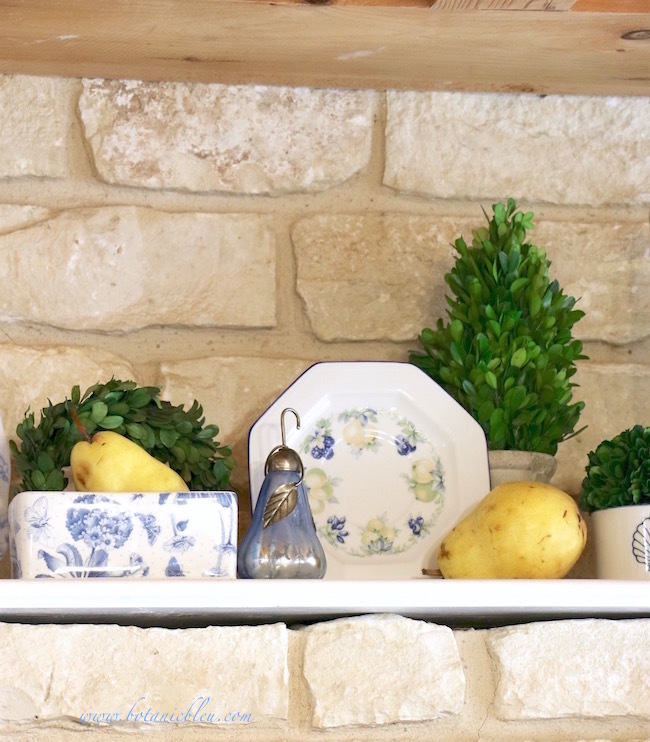 At the beginning of the year, I styled the shelf in my kitchen stone wall with boxwood and my favorite blue and white dishes collected over several years. With each new season this year, I updated the shelf with just a handful of changes. 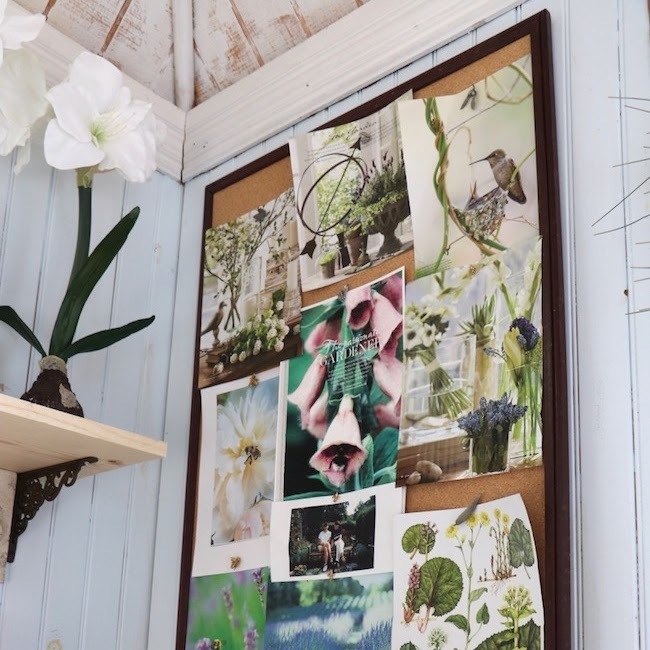 By exchanging one or two colors each time, the shelf went from the previous season to the new season. 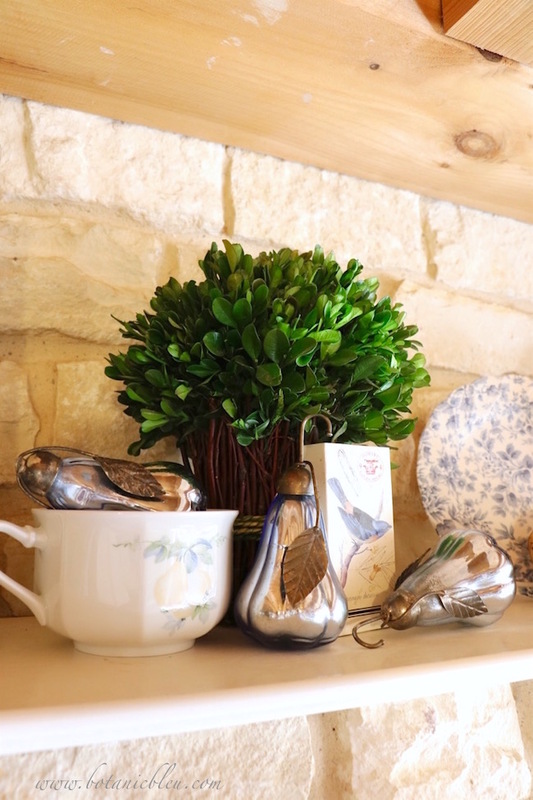 Here's the latest seasonal update to Fall on the stone wall shelf... with a French twist or two. 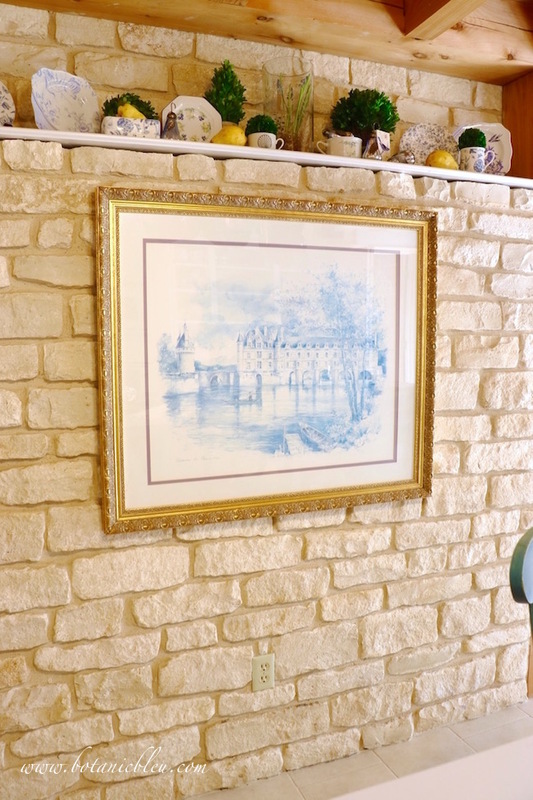 French country style is more than decorating; it is a way of life. The difference between living each day as a ROUTINE versus a JOYFUL EXPERIENCE is being aware of the little things and seeing them. Each day I look at the blue and white dishes on the shelf, and my heart is happy. Each piece has a special story that reminds me of the special people in my life. A French breakfast hot chocolate mug and saucer are the two china pieces that were added to the shelf to bring a little Fall to the kitchen. 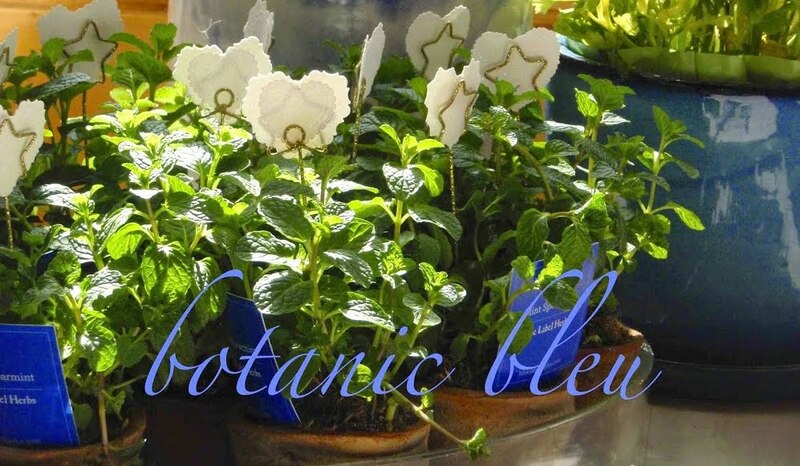 The saucer has a combination of blue and yellow fruits with yellow pears at the top. The hot chocolate mug has pears on one side and apples on the other side. Hot chocolate is served for breakfast routinely in French homes and restaurants, and hot chocolate mugs are much larger than coffee cups. 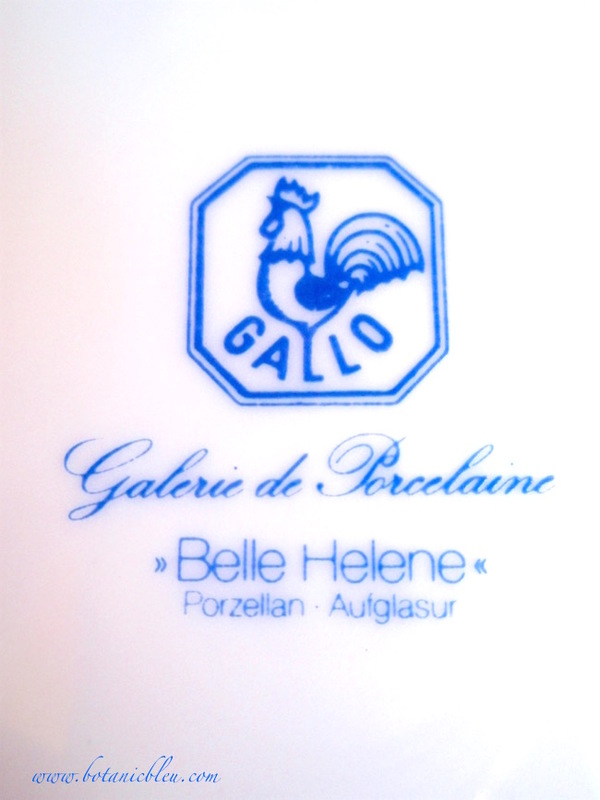 Belle Helene is the pattern name for the blue and yellow hot chocolate mug. Gallo is the French porcelaine manufacturer. For many years I traveled with the French teachers who taught at the same high school with me, and I helped chaperone their French students on trips to France. One year I found the Belle Helene hot chocolate mugs in a small shop in Sarlat, France, and we bought two of them for the lead French teacher who organized our trip. I bought one for myself. Sipping hot chocolate here at home always reminds me of traveling to France and of the hours spent with good friends drinking hot chocolate for breakfast. 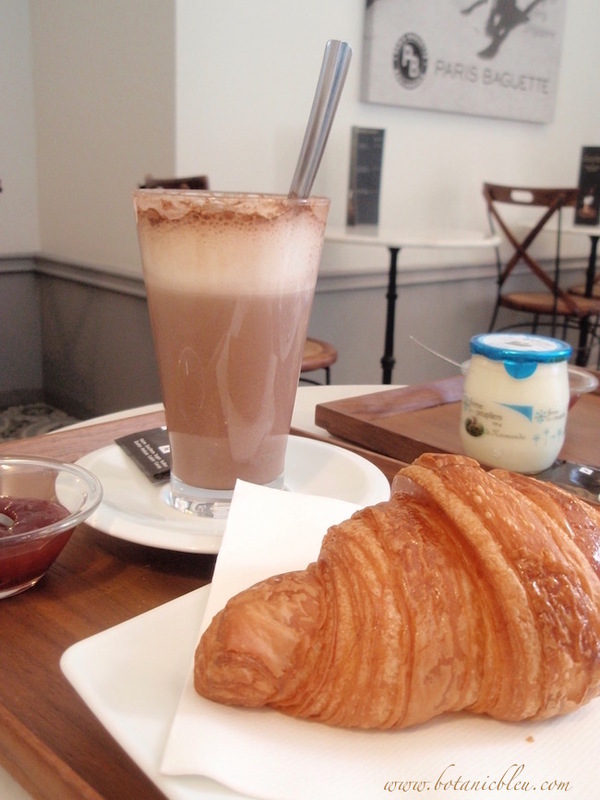 Smaller new Paris neighborhood patisseries serve hot chocolate in standard coffee cups and even in glasses. Barely awake after flying overnight to France last Fall, we had our first Paris breakfast of the trip around the corner from our hotel... hot chocolate and croissant. Yes, we truly were in Paris! 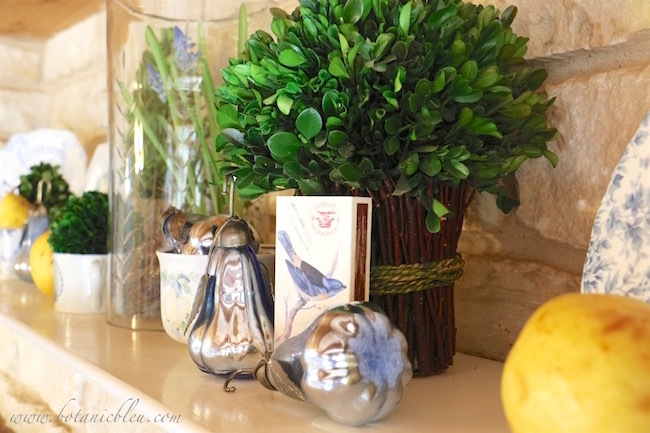 Fresh Fall yellow pears and blue metallic pear ornaments are all that are needed for more Fall touches to the shelf. The yellow pears are for eating, i.e., feeding the body. 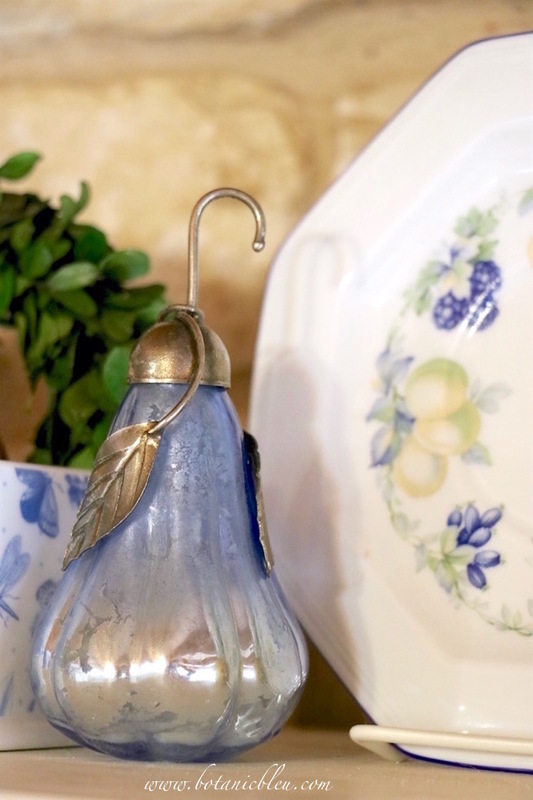 The blue metallic pears are for viewing, i.e., feeding the spirit. 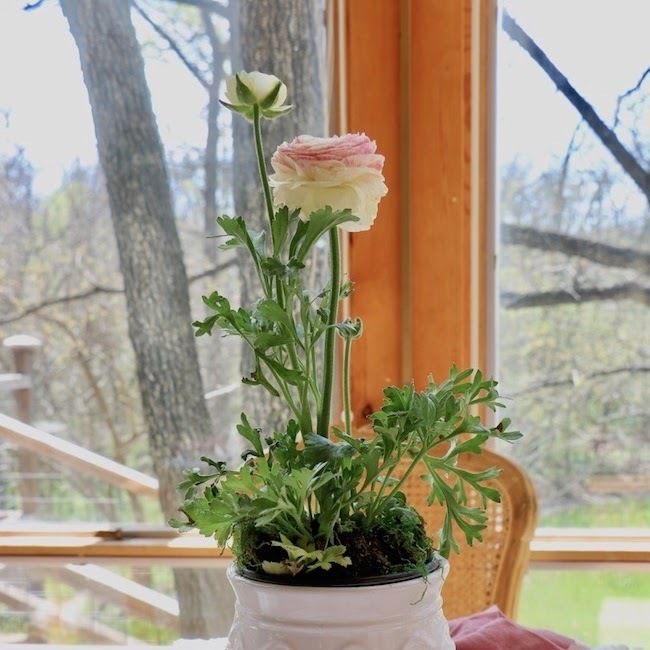 Beautiful arrangements around the house may not be seen by anyone other than us, but they give us joy. 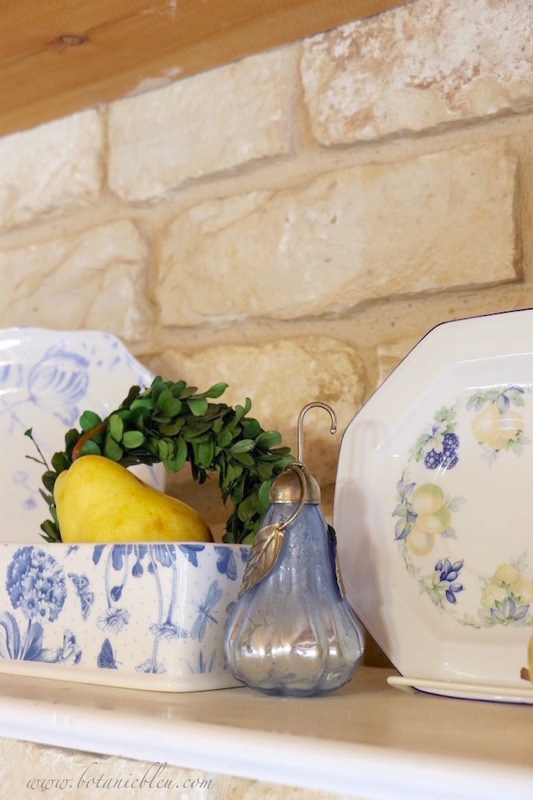 Anyone can update a blue and white dish collection to a Fall look by adding fresh yellow pears. No special dishes are needed, but dishes with yellow patterns make the arrangement last longer than yellow pears. 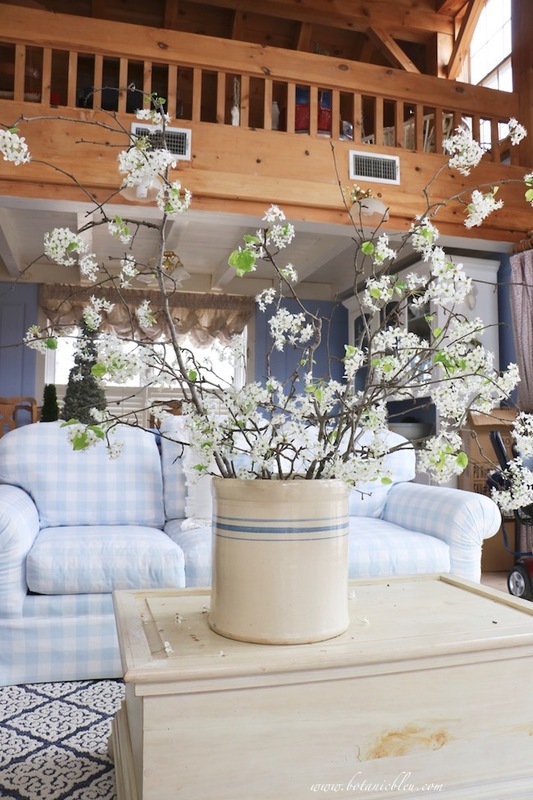 Only one or two pieces transform the everyday blue and white look to Fall decor. 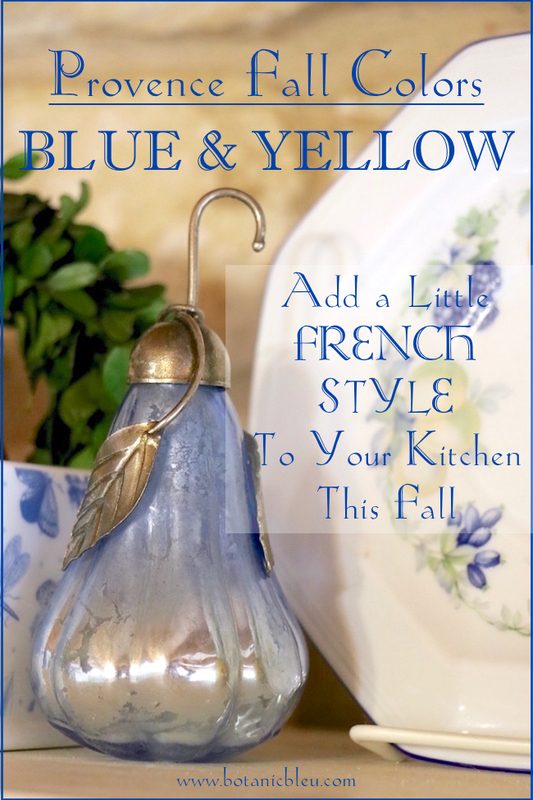 Blue and yellow are a simple, easy color combination to add a little Provence at any time of the year. We had fresh pears as part of dinner tonight. Blue and yellow are a favorite color combination of mine. I love your shelf styling. Those pears add some lovely yumminess on your shelf. The hot chocolate in Paris sounds delightful, too! I've always loved blue and yellow together. Love the mug! I picked up some faux yellow pears at At Home last month. They look so real! Lovely! The blue metallic pears are nice additions to your collected items, Judith. 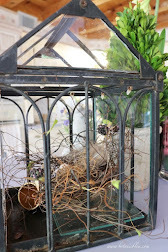 Many of my vintage and antique pieces throughout my home feed my spirit, too, but the garden (after the chores) are a tough competitor in that realm. I love your yellow and blue combination, and what a great memory with the hot chocolate cup. I love you're simple approach to styling your shelf for Fall, Judith. And I'm not sure I can live without a metallic blue pear! 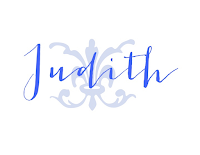 Hi Judith! 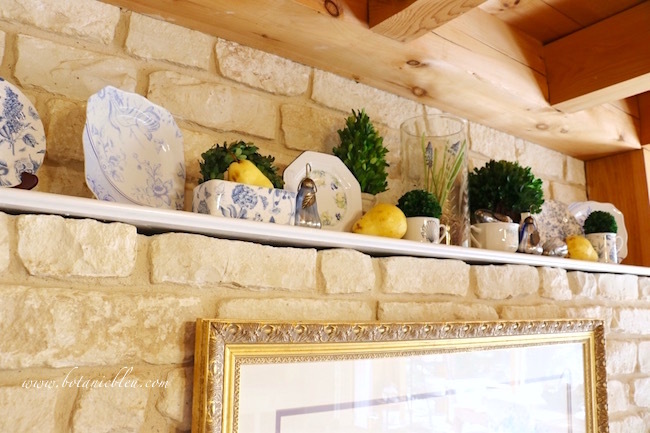 You are so blessed to have a stone wall, especially in the kitchen. I love it that you change the decor to match the seasonal mood. You have done a lovely job with fall. I really like the oversized matchboxes that are embellished with a print, a vintage graphic, or other adornment. Your display is wonderful; another job well-done! I love all your blue and yellow colors for Fall! Your style is so unique and special. Always love stopping by for new ideas!! Happy Fall! Beautiful blue and yellow vignette Judith. 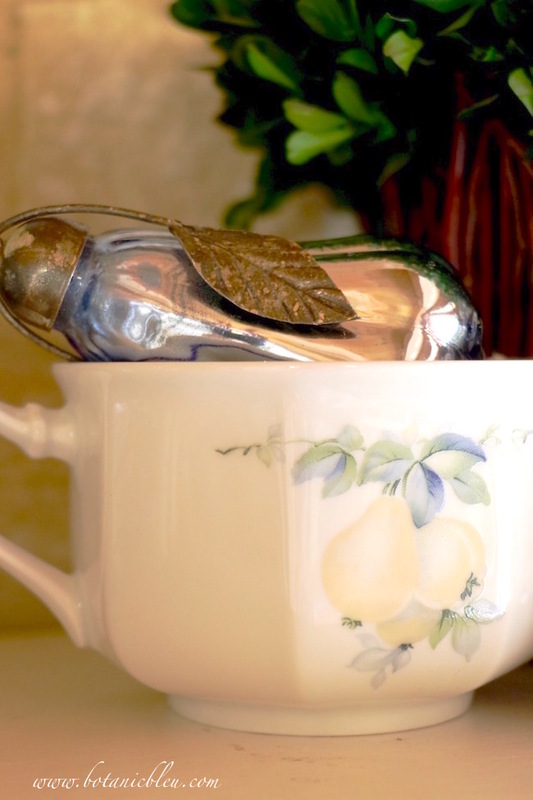 I especially love those mercury glass pears. Your writing and pictures bring one to a place of peace as I feel like slowing down and savoring every word. Paris! 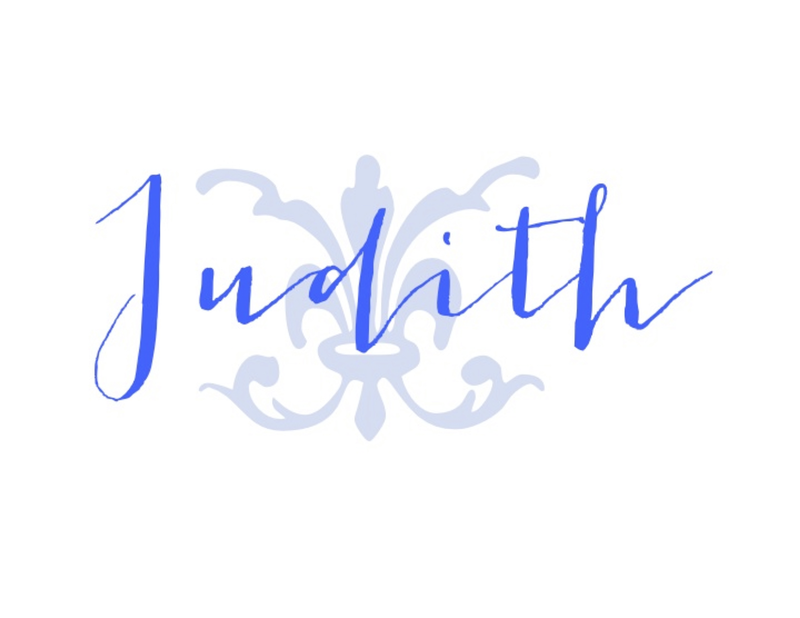 Just beautiful, Judith! My favorite combination, I love adding yellow accents to my blue and white china. Wish you could come and arrange things for me!